Hard metal applications field includes also drug & food industry. One of the most critical, yet least considered matter in this field is the contamination of prime materials during the manufacturing phase. 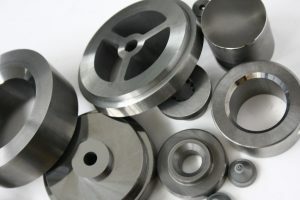 Machine components subject to wear during production must be composed of non-toxic materials with low corrosion rates: nozzles, shutter, plates, valves, trowels and all other parts that are in direct contact with aliments, must comply with distinctive standards to achieve quality products. Contamination of the manufactured product. Fast wearing of the homogenization machinery components. 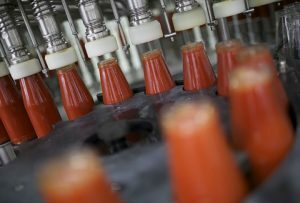 The critical elements of manufacturing ketchup are the chemical acidity grade of the product, as w ell as corrosive properties of the detergents used to cleaning machines at the end of the production process: FILMS laboratory studied the subject and tested a technical solution, working not only on component design, but also on their chemical compositions. The main homogenization valve, where the manufacturing phase happens, is the subject of the study: the valve stem and seat. In a more detailed study on corrosion resistant materials on acidic environment, the FILMS laboratory developed a new hard metal grade, where metallic element have been added to a Nickel (Ni) binded grade, with an impressive improvement in corrosion resistance. During the experimental phase, corrosion tests were conducted with sodium hydroxide (NaOH), Nitric acid (HNO3) and phosphoric acid (H3PO4). While using standard grades a loss of 0.700% of weight was noticed, the new experimental grade achieved superior results, with a weight loss of 0.035% max. Even in subsequent production tests made in collaboration with interested customers, the results were surprising: the components made with new grade had an average life span of up to fifteen times longer than before. Related to these results there are numerous benefits on many levels: a drastic decrease of contamination of the finished product with positive effects on quality, lowering the cost of production and also a reduction of downtime for maintenance: the production rate changed from an average of 18 hours to 15 days without down times.